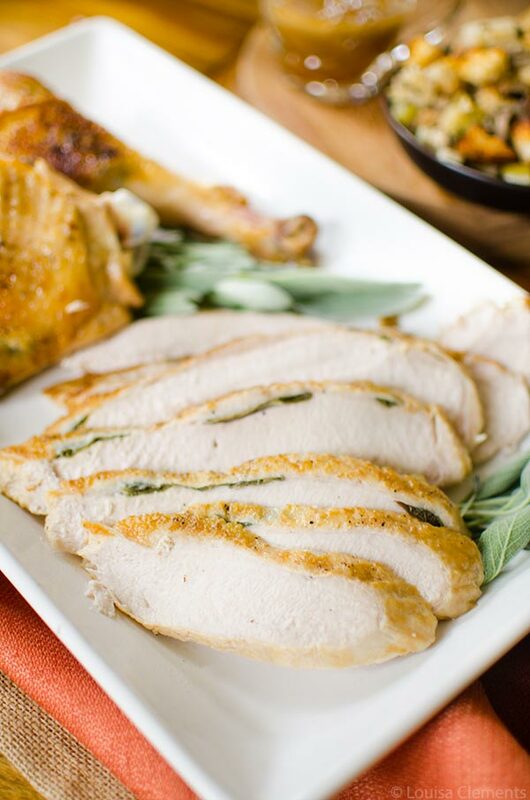 Use the crockpot this Thanksgiving with this recipe for slow cooker turkey breast made with sage, lemon and white wine for a perfectly moist turkey breast. I’m kicking off the first ever Thanksgiving week with a recipe for slow cooker turkey breast that is perfect for Thanksgiving dinner. 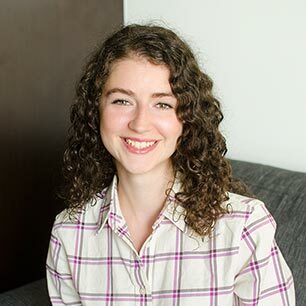 This year, I thought I’d dedicate and entire week to recipes to prepare for Thanksgiving (which happens in October in Canada, next weekend to be exact). I just love Thanksgiving, I think it’s my favourite holiday; after all, it’s all about the food. I think for most people, cooking an entire turkey is pretty intimidating, plus it takes up your entire oven, so I’m here to offer the best possible solution to you; make your Thanksgiving turkey in the slow cooker. You’ll still get that delicious turkey flavour and gravy, but without it taking up your entire oven for hours and hours. Plus, this way you’re still able to make stuffing and pie. Speaking of stuffing and pie, those are the other two dishes that I think are the most important for Thanksgiving. And I’m so excited to share two new wonderful Living Lou recipes for stuffing and pie this week (come back on Tuesday and Thursday for those recipes). You will fall over when you make the pie, it’s that good. A little hint for you, think about your two favourite holiday pies in one. Now, if it’s your first time hosting Thanksgiving I think this recipe for slow cooker turkey will be the perfect way to get your feet wet and host a successful Thanksgiving dinner. This slow cooking method is best if you’re serving a smaller crowd of 2-4 people, or if you’re having a potluck where people are bringing all sorts of other dishes (I’ve got a few potluck style recipes linked below). Make the pie the night before. Cook slow cooker turkey breast in the slow cooker for 4 1/2 – 6 hours. Bake the stuffing in the oven. Cook mashed potatoes on the stovetop. Make gravy from the slow cooker turkey. And voila! I would ask someone to bring a fall salad, someone else can bring some roasted brussels sprouts or green beans and you’ve got yourself the makings of a pretty fabulous Thanksgiving dinner. Wondering what is under the skin of the turkey breast? Those are fresh sage leaves which I love to stuff under the skin for maximum flavour, your turkey breast will be infused with the slightly woodsy taste of sage, but it won’t overwhelm the flavour of the turkey. I love fresh sage, I think its one of the most beautiful herbs out there and find the flavour incredible, but its the kind of herb that should also be used sparingly because it has the ability to really overwhelm a dish. Here I’ve stuffed about 6 leaves or so between the skin and meat of the turkey. I’ve also seasoned the turkey with lots of salt and pepper and then seared it off for a few minutes per side to get that beautiful golden skin before adding it to the slow cooker. This gives it more flavour and much better presentation at the table (which is pretty important for Thanksgiving if you ask me). 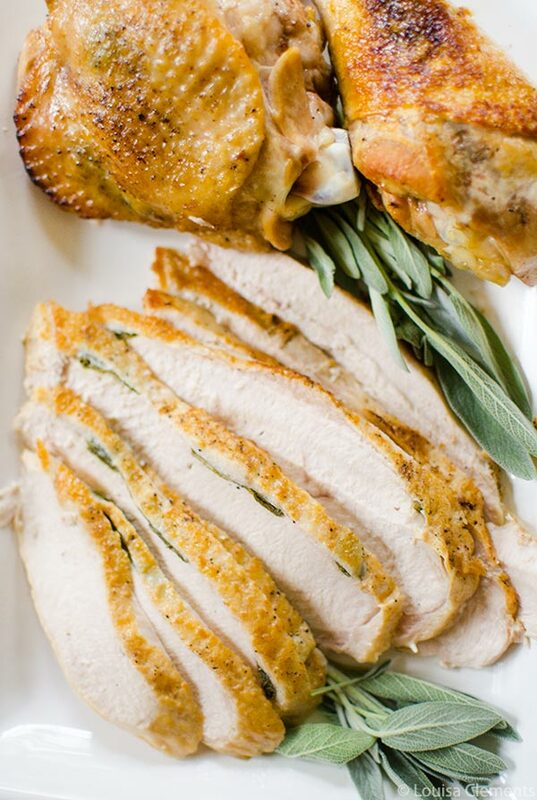 Loosen skin of turkey breast: slide fingers underneath, careful not to tear the skin and arrange sage leaves. Season all over with salt and pepper. Heat canola oil in a large frying pan over medium-high heat. Sear turkey, skin side down for 2-3 minutes per side. Transfer to slow cooker insert. Reduce heat to low, add chicken broth and white wine, scraping brown bits off the bottom of the pan with a wooden spoon. Cook for 2 minutes. Pour broth mixture over turkey. Arrange cubed butter over turkey. Cover and cook on low for 4 1/2-6 hours or until an instant read thermometer reaches 165F. Remove and let rest for 10 minutes, then thinly slice. (Reserve the bones for homemade turkey broth). Strain liquid from the slow cooker, boil in a small saucepan until reaching desired thickness, about 12-15 minutes. 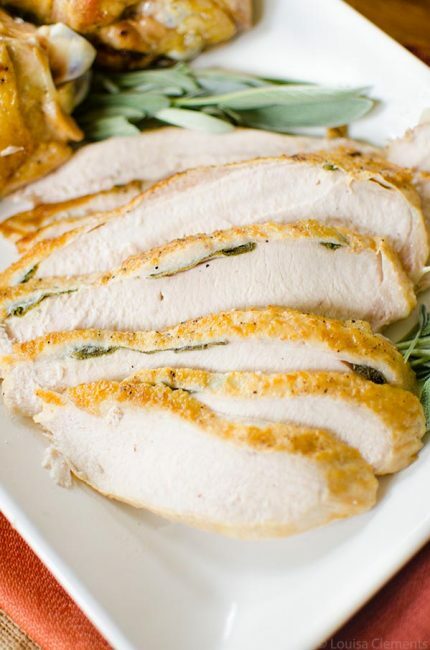 This recipe can be scaled down, I've made this recipe with a 2lb turkey breast for 4-5 hours on low, alter amounts of sage (3-4 leaves) and salt (3/4 tsp to 1 tsp). Looking for the perfect holiday brunch recipe? 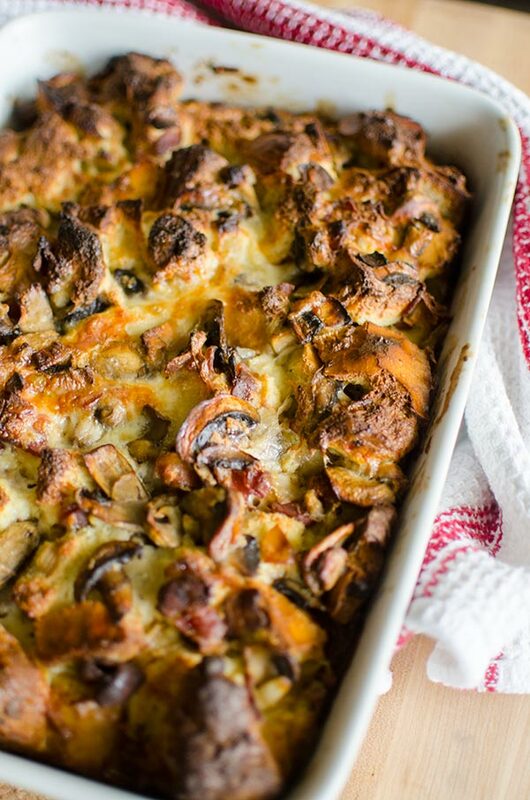 Try my smoked cheddar, bacon and mushroom strata. Enjoy this slow cooker turkey breast, let me know if you give it a try.